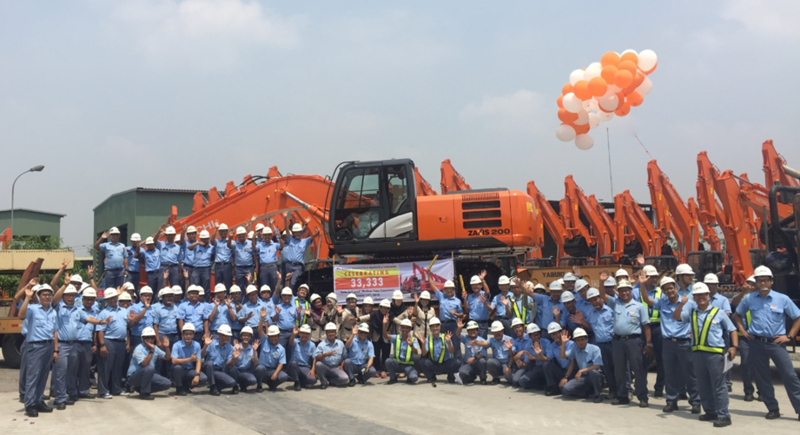 In October 2018, PT.Hitachi Construction Machinery Indonesia (“HCMI“) had cause for double celebrations. Established in Indonesia by Hitachi Construction Machinery Co., Ltd. on 1st October 1991, HCMI celebrated its 27th anniversary as well as the achievement of a new milestone of shipping an accumulated 33,333 units of its medium size hydraulic excavators. The 33,333th unit was manufactured for the customer of Hitachi Construction Machinery Thailand Co., Ltd. Since 1991, HCMI has been manufacturing medium-sized hydraulic excavators – (mainly in Indonesia for export to Thailand and Malaysia), key components for large and ultra-large hydraulic excavators, shovel buckets for ultra-large hydraulic excavators and vessels for rigid dump trucks. From 2015 onwards, HCMI has been expanding its exports to emerging Southeast Asian markets such as the Philippines, Singapore, Myanmar, Vietnam, Cambodia and Laos. As outsourced production machinery, trial units were delivered to South Africa Pty. Ltd., and in the second half of 2018, a mass-produced units shipment started to the Middle East and Northwest Africa. Going forward, we hope to open new representative offices not only in Asia, but also in other parts of the world where customers wish to use our ZAXIS-5G medium hydraulic excavator.